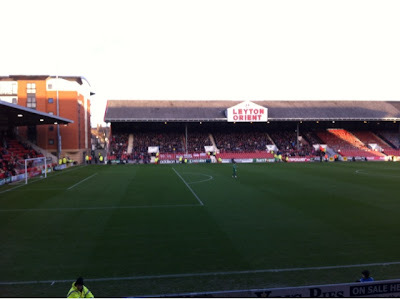 Partially Obstructed View - Football Soccer: POV-FS - On the Road - England - Day Nine & Ten: The Away Pub Experience and off to the Orient. 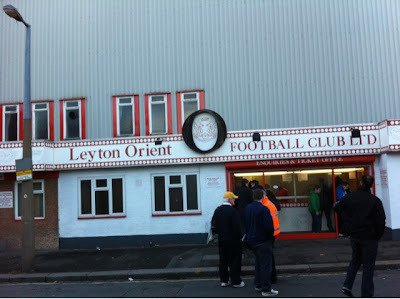 POV-FS - On the Road - England - Day Nine & Ten: The Away Pub Experience and off to the Orient. Having spent Friday on the mend - my cold has come back with a vengeance - I was as chipper as could be come Saturday morning and ready for a full day of football. After a quick Tube ride over to East London, the plan was to catch the early match on tele - Newcastle v Chelsea - before taking in an FA Cup match between Leyton Orient and Gillingham. 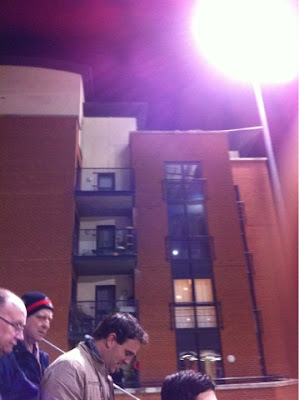 Upon selecting the pub closest to the ground, the Coach & Horses, the match wound up being secondary to the proceedings. It turns out, due to its proximity to the stadium, the pub had been selected as the base for the visiting fans to assemble. 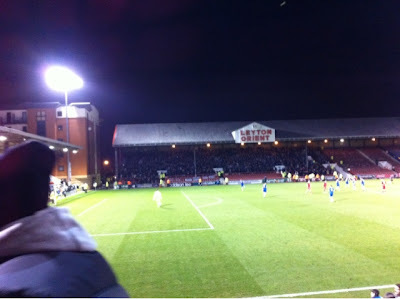 Being a neutral, there were no concerns of cheering for the wrong side, though my red hat did garner a few looks. Pockets of police were surveying the scene from every direction, occasionally strolling through to make their presence known. It all seemed wholly unnecessary to me, but then again I didn't live through the troubled times of the past. It struck me that even though there was a match on the tv the crowd could care less about what was happening; the occasional person wondered who had scored Chelsea's goal - Drogba with a header - but they all seemed rather focused on the drink and their fellow supporters. The commentary was either off or could not be heard through the din. The occasional bellow of "Gi-ills" broke through the rumble, and soon enough it was time for the match. 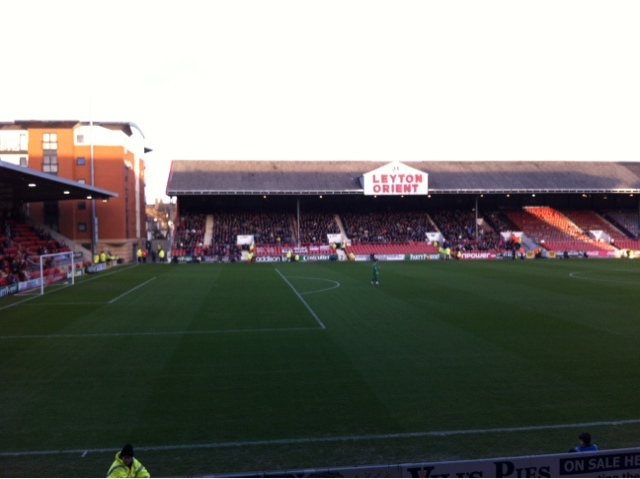 Having not preordered tickets the choice between the home and away stands was on offer. The home stand was wrongly chose - the away support was far more vocal and would have been enjoyable. Now, Brisbane Road is another neat old ground. Tucked in behind the High Road and rows of houses, it's unassuming facade on the east rose up meekly from nothing. The west stand was slightly more pronounced, but still not as grandiose as the Emirates or Old Trafford had been. The one feature that struck me most about the ground was the flats constructed at way corner with their balconies facing the pitch. 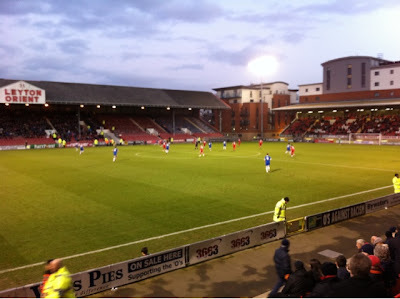 I had seen them before - such as when Arsenal drew at the Orient last season or the year before in the Cup - and I've always enjoyed the free views provided by some English grounds. Dreams of living in one someday, with halftime snacks in the oven and the kettle ready to boil once the whistle was blown. The sparse home crowd was slightly underwhelming and made more noticeable by the lack of a recognizable supporters section. The occasional vanishing chants were grossly outdone by the rowdy away support produced by their opposites. 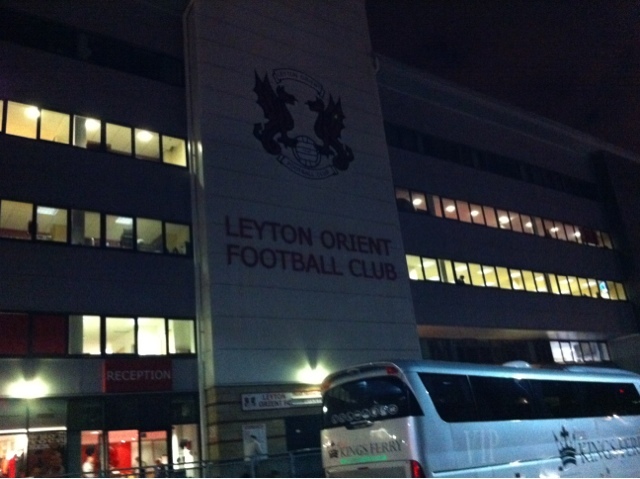 Gillingham - a league two side - took the match to their hosts - of league one - from the off, before finally capitalizing. They dominated the first half and were it not for a particularly reserved refereeing performance - he barely called anything all match - they would have had a penalty or two go their way, as at least two handball shouts in the box went unanswered. 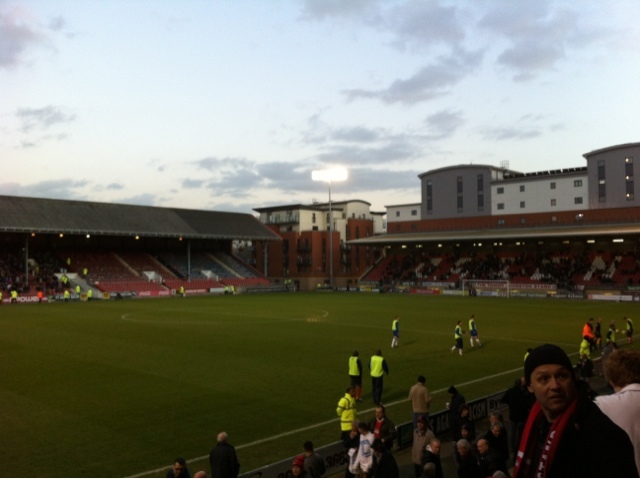 Orient came out better in the second, but could barely string together a succession of passes. They did press well in the final fifteen minutes, but could not find an equalizer. A final chance fell to one player who smashed a shot from close range goalward, only to see it carom off the underside of the bar. Despair to the home fans, followed by jeers of disapproval as the writing was on the wall and the lower ranked opposition would move on to the next round. The fifth match of my trip and a peculiar pattern has emerged, it appears as though I am a curse on the home side. Arsenal fell behind and only drew level in the final minutes. Forest were dismantled by Leeds on an emotional night. Manchester United were knocked out of the League Cup by lowly Palace. And now the Orient too felt the wrath of my presence. Only FC United managed a home win whilst I was in attendance and that was not at their own home, as they have yet to build it. I mused on Twitter perhaps that is why Toronto FC cannot catch a break. Oh well, must simply be coincidence. Next up, another, and final chance to break the cycle, as well as an opportunity for another cup upset as the last match of the trip sees non-league Sutton United at home to Notts County. The renovated entrance on the opposite side of the ground.